Last week at this time, Toy Fair wrapped up for 2017. This industry event brings together manufacturers, retailers, buyers, and media, to preview the new releases for the coming year. Not everything we see will make it to market, and not everything we see should. But we all have our favorites, the items we'll be anticipating and hoping survive the arduous process to finally make it to market. I couldn't make it this year - my twins were born at the same time 16 years ago, and that has made my attendance since then spotty at best. In a couple more years, if I'm still doing this, and I can tolerate going to NYC in February, I may start being a regular again. Until then, I live vicariously through all the other terrific media outlets that do make it, many of whom I have linked to through out this list. I usually have one odd ball favorite, something most others might not have in their top 100, let alone top ten. The TeeKeez are my entry in the contest of the unusual. It helps they are Batman themed. You know I love Batman, and you're going to see a majority of the picks in this list are somehow related to the Caped Crusader. Tiki related merchandise is all the rage right now, and the new Alien Tiki mugs from Mondo are a hot item. I only saw photos of Batman, Harley, and Joker so far, but I liked all three designs. I came across these guys while perusing Action Figure Insiders coverage of the Cryptozoic offerings. Photo courtesy AFI. 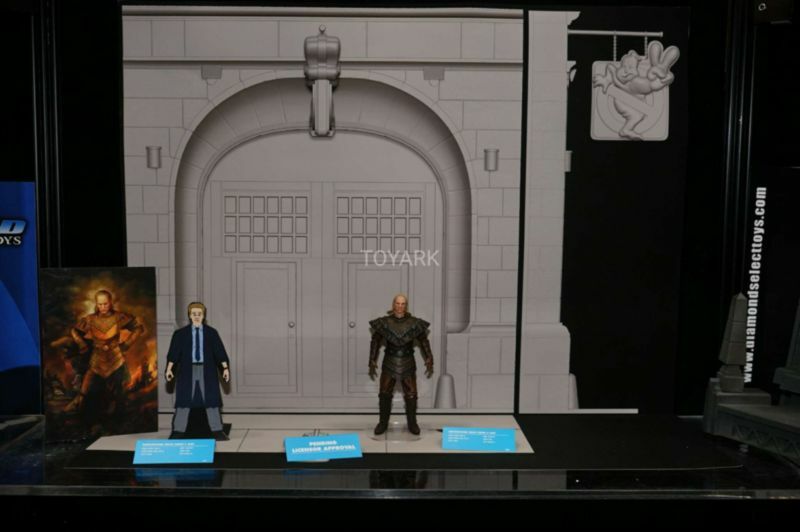 Some items go up for pre-order immediately when they are announced at Toy Fair. And some of those items are immediate pre-orders for me. 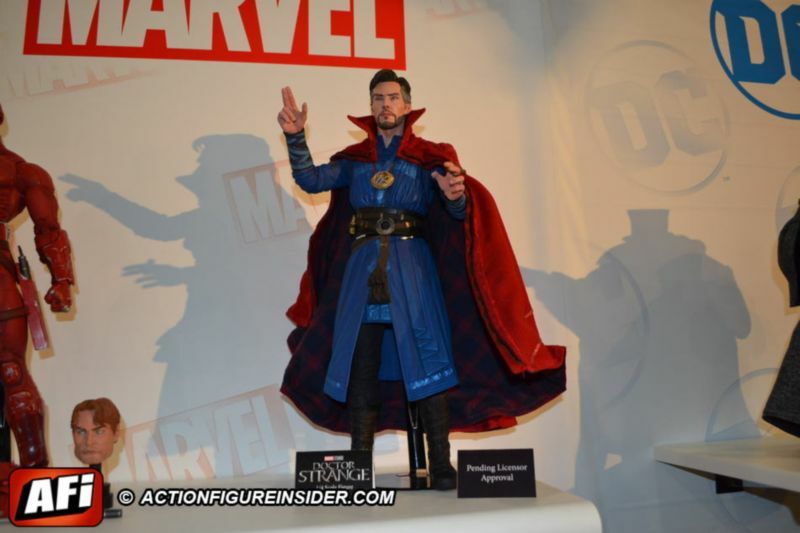 The new quarter scale movie themed Doctor Strange from NECA is just such a beast. I enjoyed the movie - not as much as Guardians or Ant-Man, but I still enjoyed it quite a bit. The big draw is the character design, which I think the film nailed. I can't wait for the Hot Toys version to hit, and this addition to my 18" figures is going to receive a very warm welcome. 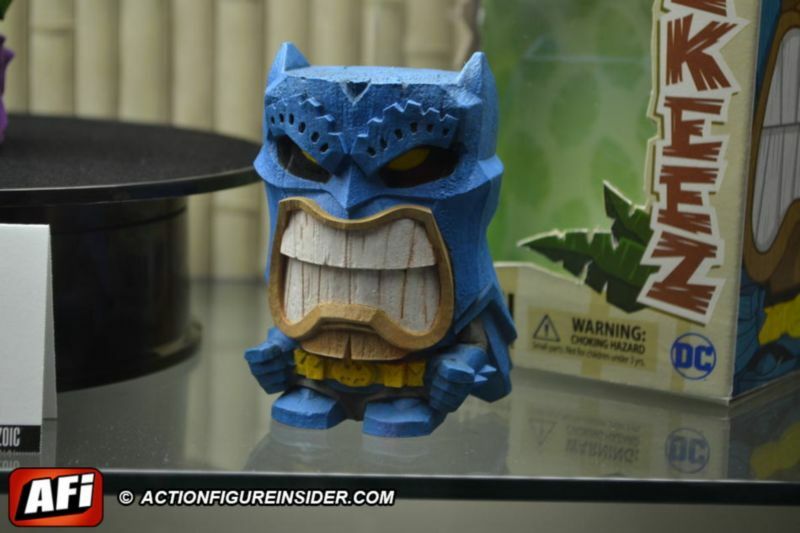 The photo is another courtesy of Action Figure Insider, who have their usual excellent Toy Fair coverage. Every Star Wars anniversary gets something special, but it's not always good. Digging deep into the nostalgia bin doesn't always produce a winner, but I think the combination of the 6" Star Wars Black figures with the retro style packaging is a terrific concept. We still have to see how it plays out in terms of overall character selection, quality of the packaging itself, and availability, but I have my fingers crossed. It's going to be very, very hard for anyone to top the Ghostbusters rooftop diorama as the best BAF style addition with an action figure line in 2017. The diorama is huge, detailed, and gorgeous. DST may be doing a follow up with the Firehouse, or at least the front door and sign, with the on-going series. It's also excellent marketing - they can do a figure of Baby Oscar and I'll buy it if it has a piece of the firehouse included. Toy Ark does excellent photos of all the conventions, and you can find their DST Toy Fair coverage here, where I snagged the photo below. Mattel's Multiverse 6" series has had its ups and downs so far, but all the offerings they showed at Toy Fair looked good to me. 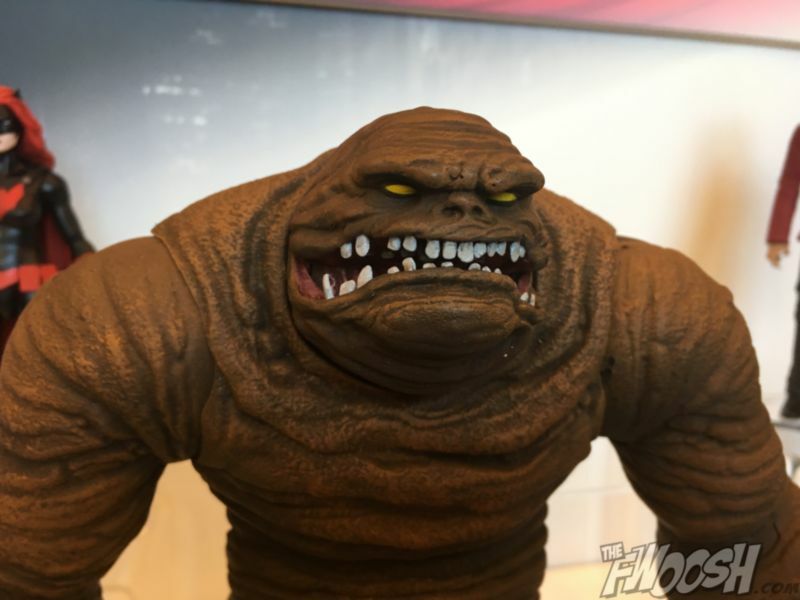 But the stand out is the huge CnC Clayface, a character that always makes for a great action figure. Let's just hope the line continues to sell well enough to get to this wave. As they do every year, The Fwoosh has terrific coverage of the show, and that's where I grabbed this nice photo of the big guy. The craziness that was the initial waves of 1966 Batman Television merchandise has slowed over the last year or so, but it hasn't dried up. DST continues to do some terrific busts and statues, Tweeterhead has their amazing statues, and Factory Entertainment has a very cool (and very expensive) 1/64 scale Batcave coming. But the announcement that got me excited was from Funko, makers of the ReAction figures (and Pop! vinyl, of course). 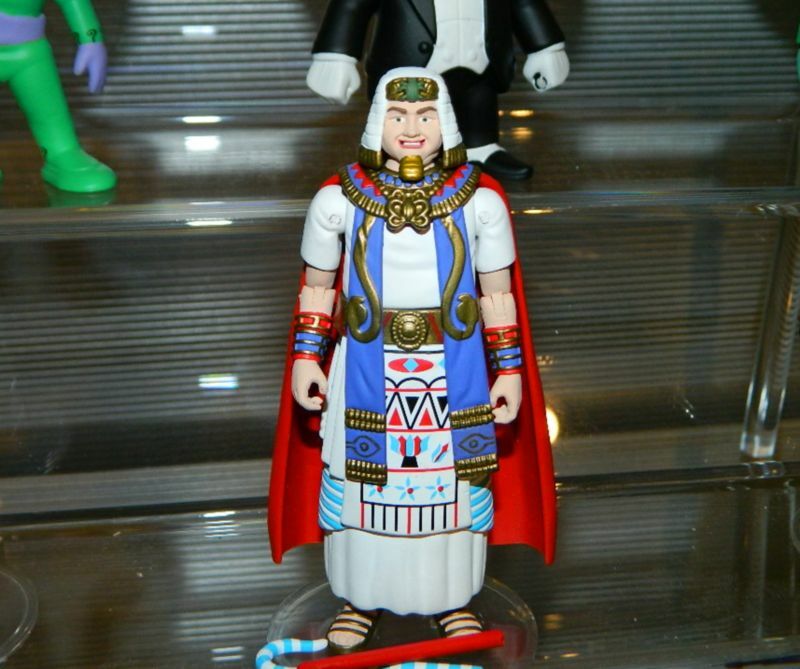 They had a number of 4" figures with improved articulation and sculpts based on the show, and it included some very cool characters, like King Tut and Bookworm. I won't be able to resist this series, but if they do any impossible to find exclusives, I'll be seriously annoyed. Photo courtesy of Figures.com, where they have a very well structured, easy to use set up for their Toy Fair 2017 coverage. Perhaps my most anticipated series of all right now, the One:12 Collective from Mezco, had a ton of excellent new announcements. From Ash Williams to Darkseid to Doctor Strange, there's something for everyone. 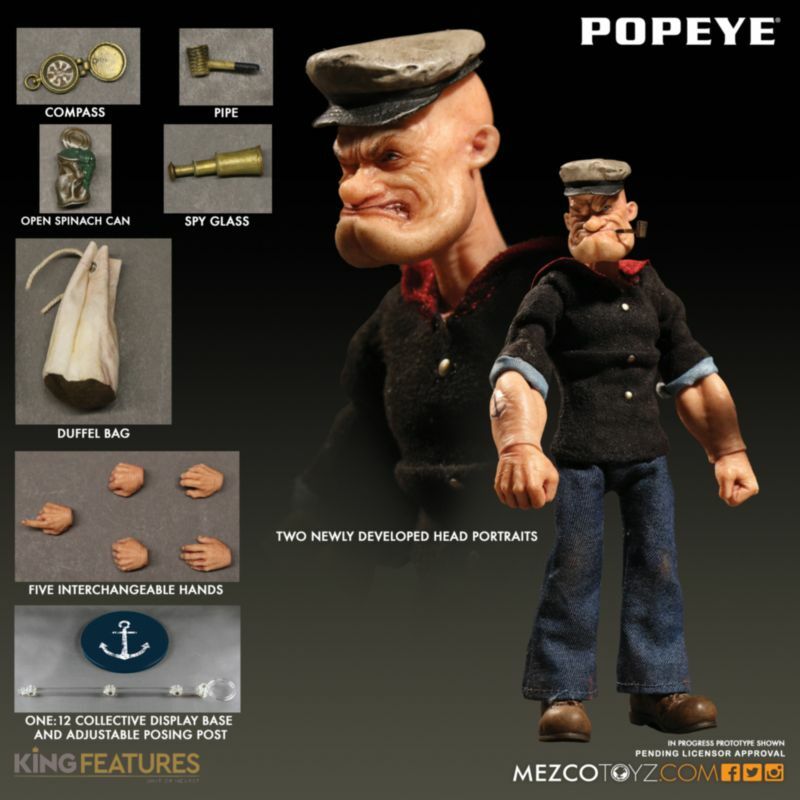 But the most surprising was Popeye, a character I'd never thought I'd see in this format. I can guarantee it won't be their most popular, but I'll definitely be buying one. 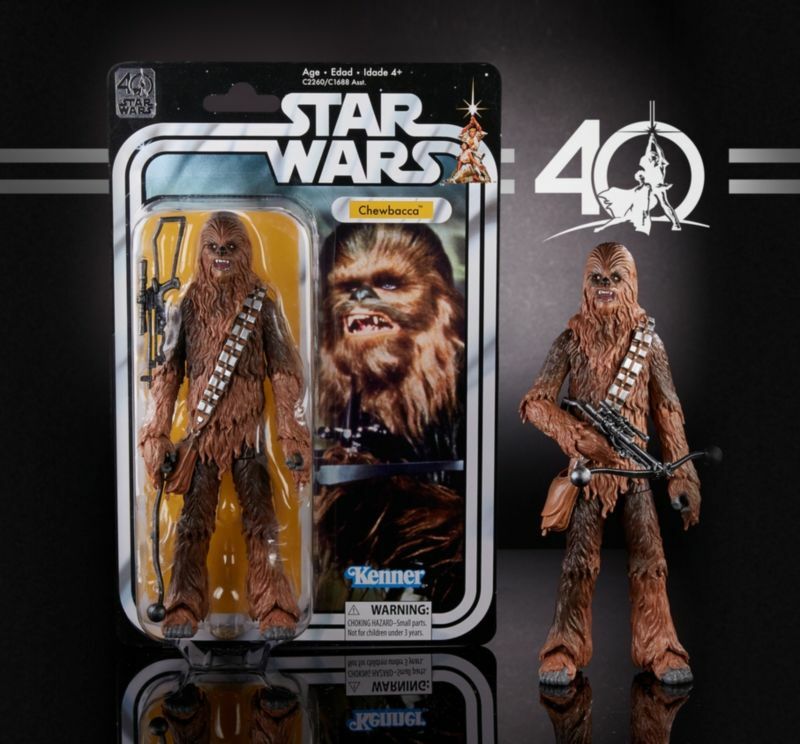 Photo courtesy of Mezco, and click here to see all their newly announced figures. Rick and Morty is finally getting the love it deserves, as we all wait impatiently for season three. Funko has some figures up for pre-order in a couple different formats, and I have those already in the cart. But McFarlane made an announcement that took me quite by surprise for a couple reasons. 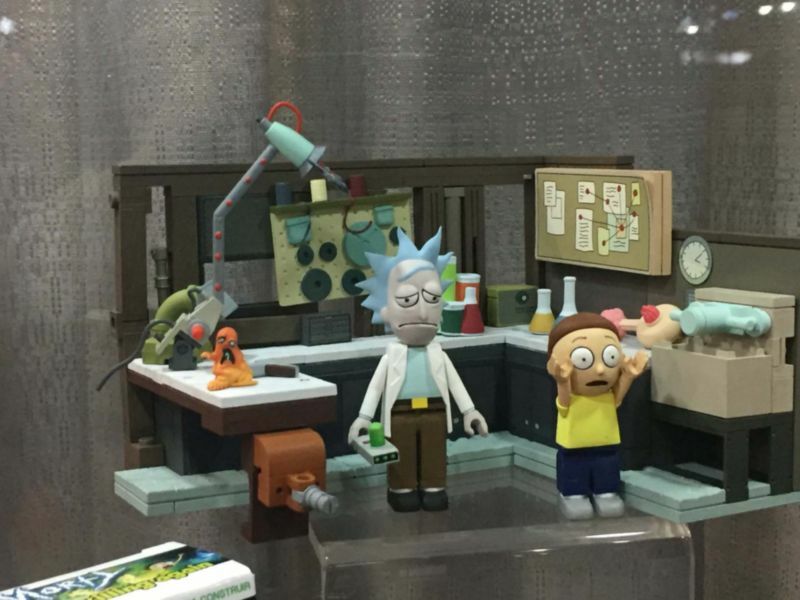 They announced a series of building sets for Rick and Morty (as well as South Park, another license I'm all in for). I was surprised because McFarlane has been out of the animated world for quite awhile...and I thought their building sets were all but dead. While the Walking Dead series did relatively well, the Game of Thrones sets were DOA. Will animated properties like Rick and Morty, South Park, and Steven's Universe be the better fit? I don't know, but I do know I'll buy every Rick and Morty set they produce. Photo courtesy of Kastor's Korner, and you can find all their great coverage right here. At the start I said something about Batman being dominate in this list, and yet eight picks in and I've only mentioned three Batman related items. What gives? Don't worry, he finishes strong, taking the top two spots. Mattel has their new 'Justice League' series hitting stores, and there wasn't anything about the regular line that tripped my trigger. To me, it was a lot more of the same. 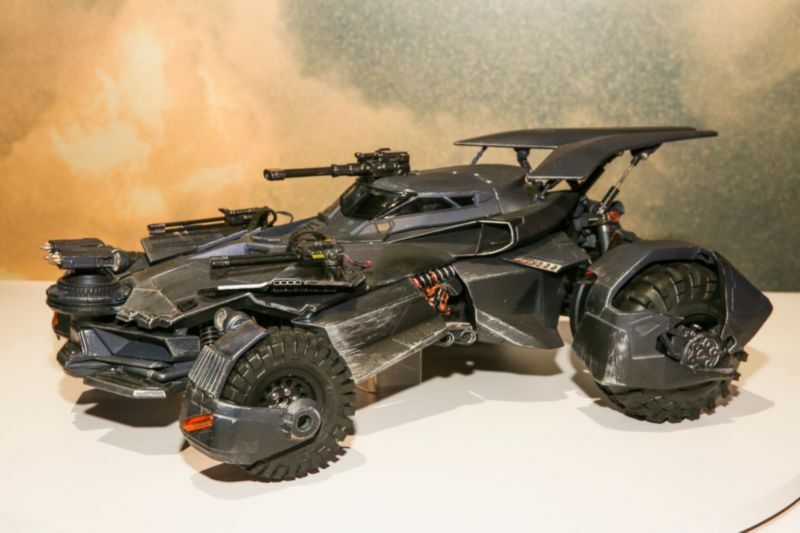 But then they showed off the new Batmobile - oh. my. god. This thing is beautiful, with a ton of working parts, all RC. It even has smoke coming out of the exhaust! It's going to be very, very expensive (~$250), especially considering it's Mattel, but it really is a thing of beauty. I think it will make it to market, but I'm worried they'll strip some of the features to get the price down. Time will tell, but I'm definitely buying. I've raved on more than one occasion about all the amazing that is the Batman Animated series of action figures from DC Collectibles. While they had some very nice figure previews (although the switch from single packs to only multi-packs after Batgirl is a bit concerning), it was their 'Batcave Vignette' that stole my heart. 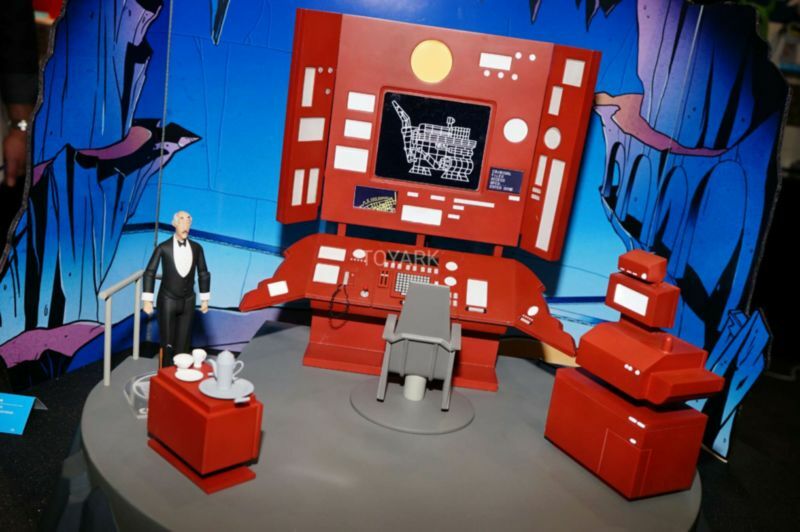 I love anything and everything Batcave anyway, and a diorama like this...excuse me, 'vignette'...is right in my wheelhouse. Please, oh please, oh please, don't be a toy that ends up on a new 'top ten unproduced list' a few years from now. 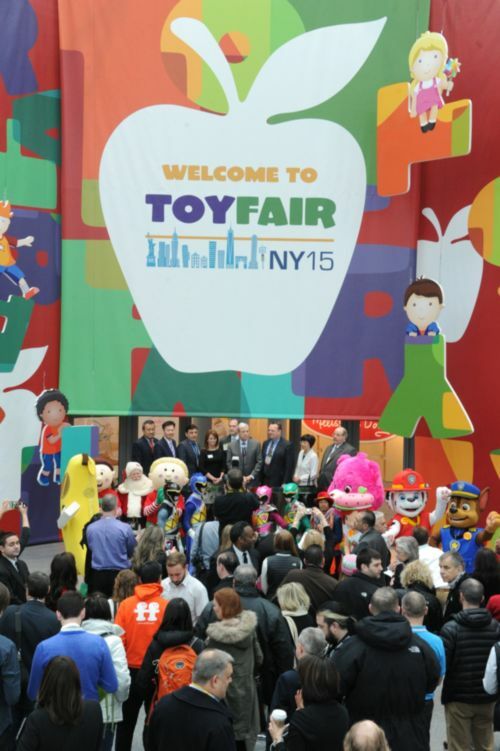 Image courtesy Toy Ark, who have excellent coverage on everything Toy Fair this year. Batman ended up taking 5 of my 10 spots, including the top 2, and that's really no surprise. When it comes to mass market toys, which is largely what Toy Fair is all about, that license is going to be one of my preferred. But surprises like the Rick and Morty sets or Popeye are what make Toy Fair so much fun. Maybe I'll look back at this list in five years and re-cap what made it and what didn't - let's hope that's a very short list indeed.